Chevrolet has been quietly working on a “flagship, medium-duty truck,” and now, the brand itself dished out some significant information surrounding the truck. Officially, the upcoming flagship commercial truck will utilize a pretty legendary combination of Duramax diesel power – likely the new L5P – and an Allison transmission. Chevy announced the truck’s powertrain at the 2017 NTEA Work Truck Show and stated that the truck is on track to be introduced in 2018. Chevrolet first applied the Duramax diesel engine to its trucks in 2001, and since then, the engine itself has accumulated more than 100 billion miles of collective use in various General Motors products. Allison Transmission has helped put Chevrolet trucks into gear since the 1950s. The truck itself is expected to be a 4500 HD model, and we speculate (keyword: speculate) that this could be the rebirth of the Kodiak. Chevrolet announced in 2015 it would partner with Navistar to build medium-duty, conventional cab Class 4/5 commercial vehicles. GM stated then the partnership would combine Navistar’s “expertise in rolling chassis configurations and manufacturing capabilities,” with GM commercial components and engines. The upcoming 2018 commercial truck will be the first conventional cab fruit born of Chevrolet and Navistar’s labor. I hope they continue to use the Express van cab structure like in the past as it has much more usable head and shoulder room. I do see a BIG need for a pickup based cab chasis 4500 & 5500 to challenge Superduty & Ram but that will have to come with the NEW redesigned Silverado. It could be the first to reveal the new cab though so this becoming very interesting. I wish they would offer these units with a larger cab and a third row of seating. Would be a perfect hauler for a race car team and a crew of 6. They offer third row seating in today’s small CUV’s and SUVs. This could definitely use one. I think you might want to say the 2017 NTEA work truck show. I’m very excited to see how this will play out. GM needs to back in this business. The last gen Kodiak/Top Kick was a like a 75% effort on GM’s part. Great visibility, excellent turning radius, sound drivetrain and chassis. Extremely cheap details on the interior. Freightliner introduced the M2 chassis around the same time as the GM twins and it pretty much kick their but. I hope GM will have a solid effort this time around. Topkick need to kick a$$ instead of disappointing like last time. I don’t understand why GM chose Navistar. 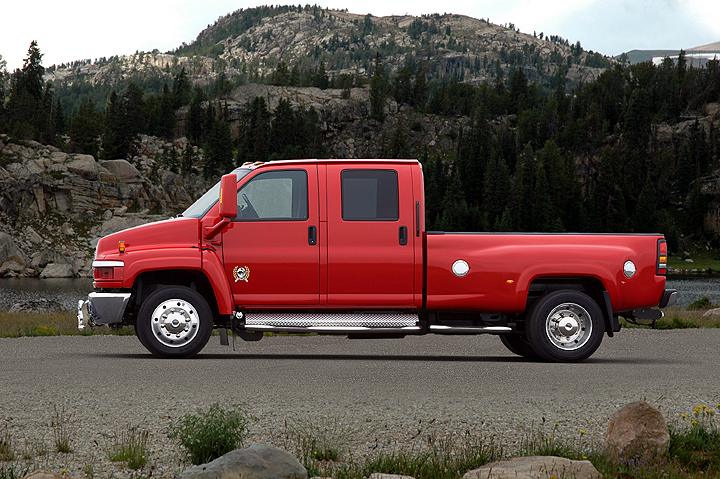 When we sold the GM MD truck it was a far better truck than Navistar. Navistar was always a cheap truck and you could do a walk around on the GM and show how much better the GM Truck was to the navijunk. They also need to have a GMC twin so their original truck division doesn’t get pushed into obscurity. Can’t tell me a different grille and hubcap logo can be that pricey. Will the sell of these trucks be added to the overall truck sells for the year like ford does? This is all that is needed! As long as the bowtie is on the hood the rest will take care of itself!